After much research and study, scientists have uncovered the basic laws that govern all feline behavior . . . .
All blazers and sweaters attract white cat hair in direct proportion to the darkness of the fabric. All cats must sleep with people whenever possible, in a position as uncomfortable for the people involved, and as comfortable as possible for the cat. A cat must lay on the floor in such a position to obstruct the maximum amount of human foot traffic. No rug may remain in its natural flat state for very long. A cat`s resistance varies in proportion to a human`s desire for her to do something. Cats also know that energy can be stored by a lot of napping. A cat`s irritation rises in direct proportion to her embarrassment, times the amount of human laughter. A cat`s desire to scratch furniture is directly proportional to the cost of the furniture. A cat will always land in the softest place possible; often the mid-section of an unsuspecting, reclining human. A cat`s interest level will vary in inverse proportion to the amount of effort a human expends in trying to interest him. 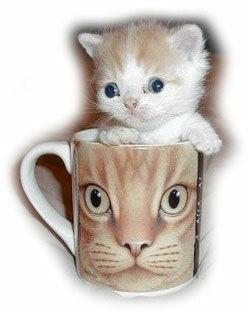 A cat is composed of Matter + Anti-Matter + It Doesn`t Matter.